People often ask us about the process of finding places to park the trailer. One of the services we use is called Harvest Hosts, an online directory of wineries, farms, and various other agri-tourism businesses that offer space for RV’ers to “dry camp” for a night, meaning there are no water or electric hookups to plug into. After parking our little tin can, we moseyed our way across the street to the berry farm. Unfortunately, we were not there during the weekend when they host brunch on their porch overlooking their crops of berries and flowers, but we were happy to snag some blueberries, raspberries, and tomatoes. Nothing tastes better than fresh, local produce, particularly juicy garden tomatoes. Before dinner, I laid down for a little rest while Tyler walked around and snapped some photos as he typically does. It felt surreal looking through the window across from our bed at the vibrant sunflowers and the blue sky above them, like something out of Wizard of Oz. It is one of my favorite views of the tour. Yet, for all of the dream-like views we have had, there are just as many views of a Walmart parking lot, but hey, it makes us appreciate the beautiful sceneries that much more. This is your warning of an extensive (but interesting!) personal research project I’ve been doing the last several months. Skip ahead if you don’t want to read it! When it comes to my grandmother’s side of the family, not much is known about her mother, my great-grandmother, whose maiden name was Clapp. Being a curious person, I did some research to find out that she was from Connecticut and had tragically lost her parents and a sibling within a couple of years. An orphan by the age of 14, she went to work in a button factory in Massachusetts where she would eventually meet my great-grandfather. I was able to find census records of her living at a boarding house where she lived with several other textile factory laborers, however, I couldn’t find much about her childhood in Hartford, Connecticut, including information about my great-great grandparents. Dissatisfied with the abrupt wall I reached online, I decided that I would visit the Hartford town hall when in Connecticut. My desire to do so was further fueled when I came across the plaque for Captain Roger Clapp while walking around Boston, leading me to suspect that I was related to him in some way. Online there was a handy resource on Google Books dedicated to the Clapp family in the colonial era that recorded the lineage of Roger Clapp. With one of his grandsons moving to Connecticut, I felt an even stronger inclination that we could be related, but I couldn’t connect it to my family’s records I discovered online. There was a gap of about one hundred years (1800s) that could potentially be filled with multiple generations (people had babies young back then!). After emailing the town hall and setting up a time to access their public records, the day I’d been waiting for finally arrived: investigation day! The whole process was incredibly exciting, even if I was standing in room poorly lit with fluorescent lights and next to a grumpy man that smelled like stale cigarettes. It wasn’t as nice as Finding Your Roots with Henry Louis Gates Jr. but I’ll take it! I was pulling my sleeves up and ready to do some digging. If you’ve never looked through official or family records from the 1800s and early 1900s, they recorded many things by hand, tiny cursive handwriting, specifically. Not recognizing any of the names I was reading and starting to wonder if I was actually understanding what I was reading, I switched to looking through the Land Grantor’s record book. Great news- the records were typed! Hallelujah! After a little while, I was further confused as I came across a Mary Clapp (yay! ), except for the middle initial was an F instead of a J (boo!). Was this just a mistake? Did someone read someone’s signature and record it wrong? Finally, after cross referencing with a different year’s recordings, I came across information that connected Mary F and Mary J and it suddenly dawned on me that they were different people but from the same family. They were different generations! In fact, Mary F was Mary J’s mother-in-law. Holy cow; why did they call everyone Mary back then?! Once things began falling into place, I began recognizing more and more names. I think I had found the gap, the gap between Captain Roger Clapp’s family lineage and mine! I thanked the man for his help, wrote everything down, took photos, and raced home to piece the puzzle together. Sure enough, thirteen generations after Captain Roger Clapp, here I am, a descendent of a Puritan that had sailed on the John & Mary boat in 1630, landing in Massachusetts. I don’t think my Puritan ancestor would have appreciated this but, HO-LY SH*T! Incredible right? I couldn’t believe I had done it. Although a little past his bed time, I called my dad to tell him the news. Hearing him laugh in disbelief and wonder was the best part of the entire experience. On a different day we visited our Connecticut Veteran, Sean Pesce. We were introduced to Sean by Andy Biggs, Founder of Boston’s Wounded Vet Run (who also helped us find our Massachusetts veteran) and although the CT project would be conducted in NYC the next month in partnership with MTV, we wanted to meet Sean and Titan, his puppy-in-training, while we were in Connecticut. After picking up a few Subway sandwiches on the way, we headed to his new house in Bethany that he had recently moved thanks to the Homes For Our Troops organization. A Special Ops Ranger in the Army, Sean shared with us his story of enlisting, the rigors of bootcamp, his injury during the last mission of his deployment in Afghanistan in 2012 over the subs in his dining room still full of moving boxes. He was incredibly down-to-earth and welcoming which got us excited for his Connecticut project. Full disclosure: we actually had a very difficult time planning the Connecticut project. We didn’t have as much help on the ground as we have had in other states with AIGA chapters, so we were trying to email and cold call any local potential partners and participants, even including ESPN whose headquarters were just down the road from where we were staying at Bear Creek Campground. No matter how hard we tried, nothing was coming together. Then we heard from Rich Tu, who was our designer in the Oregon state pilot project in January 2017. He was a designer at Nike then but had since accepted a new position as the VP of Design at MTV in nearby New York City. Rich loved participating in the Oregon project so much that he really wanted to figure out a way to enable one of his designers to also help share a Veteran’s story, so we were extremely excited to be partnering Sean with an MTV designer in an extra special project that would be hosted at the MTV creative studio office in NYC. But until then, we had a few more days left in Connecticut, so not far from Sean’s home, we went to visit the Yale campus in New Haven. It was the last week of August and there was new-semester excitement and jitters in the air. It’s actually mind-boggling how old Yale is. It was founded in 1701! That’s crazy-old. 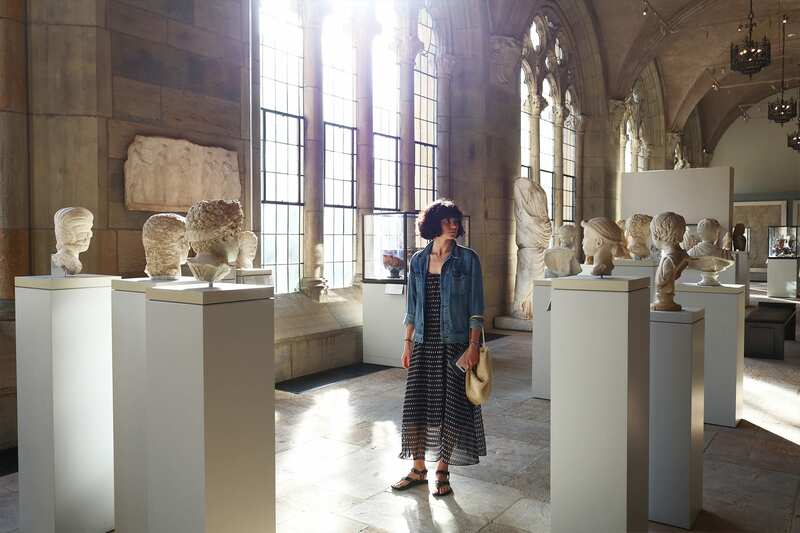 After grabbing a Starbucks and walking around Connecticut’s version of Hogwarts for a while, checking out the quads, statues, and crazy arches on buildings, we popped into the Yale University Art Gallery. My favorite part of the gallery was this stunning hall lined with tall paneled windows letting light pour onto their antiquities collection. The visit was a nice little reminder that humans have been making impeccable art for thousands of years and that this tour of sharing Veterans’ stories through art and design is a part of that historical legacy. Cool, right? We ended our collegiate visit with a stop for ice cream at Arethusa, apparently a staple of a Yale experience, that turned out to be your standard old-school ice cream shop with a strong scent of warm dairy before we enjoyed a sunset drive back to our campground. Another highlight of our stay in Connecticut was my drastic hair change. I’ve always wanted to cut my hair short so I decided, what better time than now when I’m living in a trailer with, at times limited amounts of water and electricity (think blow dryer). After all, hair grows back so try something new! My entire life people have told me not to cut my hair because the curls are great, the volume, the color, etc. and I don’t mean to complain about compliments but there comes a time where you have to ignore all of the little comments, no matter good or bad, and establish ownership over yourself. Cutting it all off was extremely liberating and was a step in the process of me realizing that I’m more than my physical appearance and curly hair. While heading out of Connecticut, we swung by the The Institute for American Indian Studies Museum & Research Center where we had an enlightening experience learning about the east coast’s Native communities and cultures. Darlene, who was in the process of becoming a storyteller of her tribe, a role that involves memorizing and reciting 90 stories, gave a presentation on the Native cultures of Connecticut’s River tribes such as the Mashantucket Pequot, Paugussett, and Mohegan tribes. We learned about how they grew crops in threes: squash, corn, and beans so that the soil stayed fertilized, the familial roles within tribes, and tools they used for hunting. After going through their exhibits, Tyler and I hiked along their trail going through the woods, swatting off late-summer mosquitos left and right, and walked through the replica village that they built according to traditions. Finding little gems like this is one of my favorite parts of traveling all over the country.